February 10 – Stability and Change in Vietnam – Come and learn about the experiences of John Moeller, and Steve and Ava Holland as they traveled in Vietnam during the month of January. John and Steve led a group of Luther students (plus Ava) on this trip to learn about the life and culture of Vietnam. 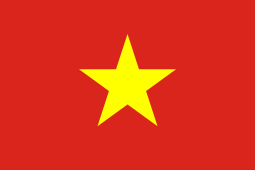 From Wikipedia: The flag of Vietnam, or “red flag with a gold star” was designed in 1940. Red symbolizes the goals of social revolution behind the Vietnamese, national uprising. The star represents the five main classes in Vietnamese society—intellectuals, farmers, workers, businesspeople and military personnel.